Following the success of the George Abecassis Centenary Trophy at Spring Start last year, it was but a small step, with the approval of the Abecassis family, and VSCC agreement, to implement an annual race in George’s name. Not only are we celebrating his racing career, but also the HWM marque with which his name, along with that of John Heath, as joint founder of that illustrious company, is so inextricably linked. This year we had no less than 6 cars entered that had emerged from the famous H W Motors address at Walton. It was particularly appropriate since just as last year we were celebrating George’s birth centenary this year we were also celebrating John Heath’s birth centenary. We have revised last year’s very specific Centenary eligibility requirements to include those sports cars that were raced during the course of George’s post war racing career, from which he retired at the end of 1956. The field represented the diversity of cars that graced sports car races in the 1950s and will remain the basis for the future running of this race. Always an event to look forward to, the Spring Start meeting pulls man and machine out from under their stones and from winter hibernation. On top of that the VSCC put on a show that is unique making a double dose of anticipation to ‘get out there’. It was a privilege to have the George Abecassis Trophy race included in this prestigious event amidst fascinating cars and the 33 car entry did not disappoint. A couple of entrants were ‘race ready’ and fresh from the Goodwood 72nd members meeting two weeks earlier including Graham Bull in the Healey Silverstone and Nigel Bachelor in the DB2/4. This ‘by invitation only’ event attracted an interesting mix of FISCAR regulars with an eclectic range of pre 1957 cars to represent the period when George Abecassis and HWM contributed so much to the development of sports car racing. Grandson Jonathan in the entry list added interest, his car one of several Healeys entered that were prepared by our sponsors, Woolmer Classic Restoration. It was a dry day, but Silverstone so often reminds us that maybe Siberia isn’t that far away after all, especially if you happened to be standing on the terraces at Luffield! A couple of no-shows reduced the field slightly but the shape of the field in practice emerged fairly quickly and you needed a reasonable amount of grunt to get onto the first couple of rows. The beautiful McCulloch Maserati in its 1957 Buenos Aires colours, driven by Steve Hart, went as well as it looked and claimed pole, but not by much from Patrick Blakeney –Edwards in Roger Buxton’s HWM Jaguar only 0.2s adrift. The shape of the next few grid rows were a mix of familiar Jaguar engines, Allard big bangers, and Andrew Sharp in the DB2 up amongst them, but the real cuckoo in the nest was Martin Hunt in 6th place in the Frazer Nash Le Mans Replica, a fine effort indeed. 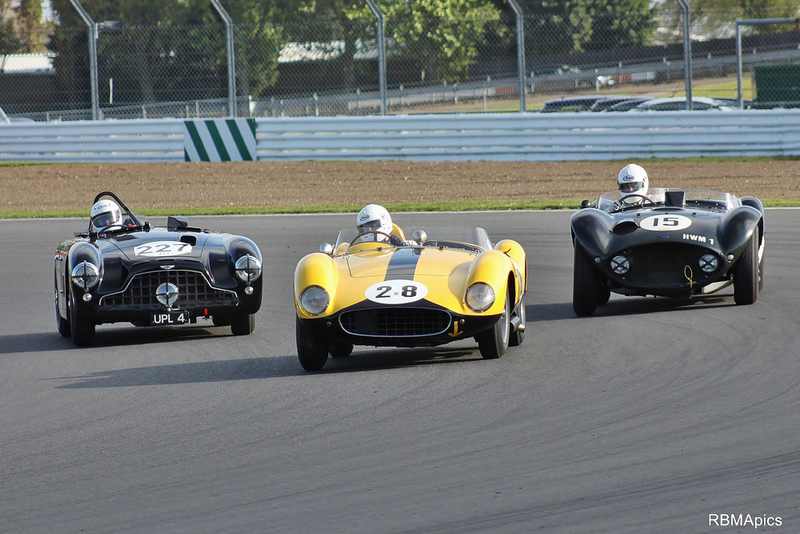 Mid-field was mostly populated with Healey 100’s, the HW Alta of Nicolas Bert sitting amongst the strong company of DB3S, Ferrari 500TRC and others. Graham Bull pulled the 1950 ‘patinated’ Healey Silverstone well ahead of where it should be, with the rare and lovely BMW engined Veritas RS of Lutz Rathenow close by. Lutz brought the car over from Germany, a most welcome visitor. Nick Leston lost his bonnet on the way to the track, but raced ‘al fresco’ nevertheless. A particularly sad loss from the field was that of Charly Willems in the famous HW Alta Jaguar Streamliner. He, too, had brought the car over from Germany, but suffered a differential failure at the end of qualifying but was amazingly philosophical about it and will be back! A serious, and ultimately, sadly tragic accident in an earlier vintage race delayed the start and reduced the race to 25 minutes from the planned 30, but the two driver stints would not be affected. We had 29 starters but this was soon to be reduced when front row man, Patrick Blakeney -Edwards had to pull the HWM off the track in a heavy cloud of smoke at the end of the Wellington Straight on lap 2, with a blown head gasket. A great shame especially as he had already taken the lead, making a firm ‘statement of intent’. 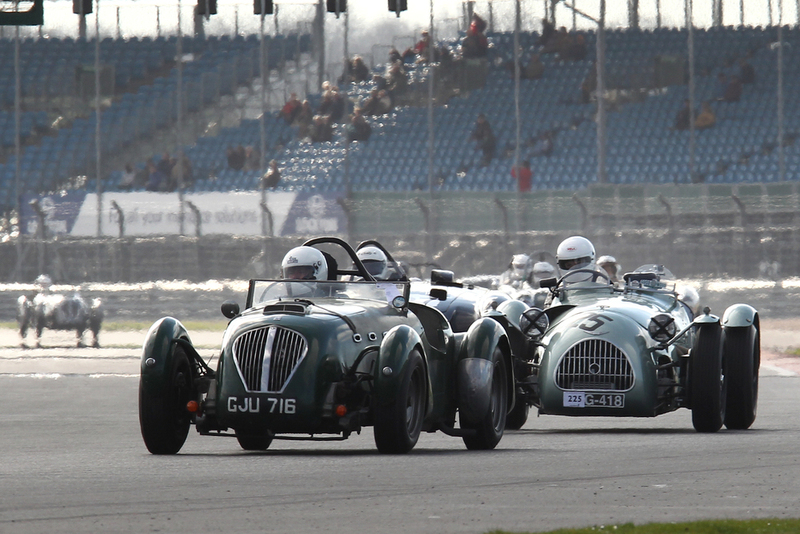 The Maserati assumed the lead but was hotly pursued by Nick Finburgh in the glorious C type Jaguar. There were good starts from Matt Grist (HWM Jaguar) from row 4 running third by lap 2; Mike Thorne (Healey 100) picking up three places in as many laps and Martin Hunt in the Frazer Nash dropping back on lap one, but more than making up for it in the following laps by getting up to 4th on lap 7. Nick Leston having practiced out of session as a result of the earlier problem, started from the back but made up 9 places in the Gregory V8 in 3 laps. Whilst the Maserati stayed ahead of a hard chasing Nick Finburgh, a gap then developed to Matt Grist (HWM) and Till Bechtolsheimer (Allard) having an entertaining scrap, then a really good tussle between Andrew Sharp (DB2), Spike Milligan (HWM) and Tom Walker (Allard), this lot swapping places all the time. All good stuff as we started to see the pit stop window open which made the race a bit difficult to follow for the commentators and spectators alike. What was most interesting from the BRDC grandstand was the variety of lines taken through Brooklands into the complex. The two Healeys of Abecassis and Thorne in close proximity taking the ‘chalk and cheese’ options by example, but nevertheless coming out with a similar result, so there is some logic in there somewhere! Most drivers pitted somewhere between laps 8-13 so the order settled down again thereafter, but not many two driver entries. Alec Poole took over the HWM Jaguar from Spike Milligan, otherwise the latter may have forgotten to stop; he has previous! Alec shaved a bit of lap time off and progressed up to 4th but playing to the crowd was later to incur penalties for the new for 2014 white line track limits misdemeanours. A well-matched pair.. The field had spread out somewhat but good dices were entertaining the crowd throughout the field. Mike Thorne got the better of Jon Abecassis after close racing; Grahame Bull staying ahead of Anthony Galliers-Pratt in the Fraser Nash; Andrew Dixey (Healey 100) and Nicolas Bert (HW-Alta) running very close. Steve Boultbee-Brooks in the beautiful DB3S spun in Brooklands after an overzealous entry speed into the corner. He so nearly held on to it, and after a nice ‘180’, he recovered safely albeit dropping back from a good race to finish 10th when a couple of places higher was on the cards. Hunt’s fine run came to an end when the throttle broke after 12 laps, handing the Class 1 win to David Cottingham in the gorgeous Ferrari 500TRC. David enjoyed this event so much that he may well put his racing retirement on hold! The quality of the driving particularly in relation to the respect for each others track space was a joy to behold. Looking at the lap charts, some amazing consistency in the lap times for the front runners; just take a look at the fastest laps for Classes 2, 3 & 4; and it should be said that in the mid-field after the pit stops we had up to 8 cars in a close group showing some great racing, fun for the drivers and spectators alike. It also ensured that lap times were held in a tight cluster, one small error and you would drop 3 places, but the standard of racing was such that this did not happen…….. much! Whilst the Maserati stayed ahead to claim a well-deserved win, with hardly a step out of place in the entire race, equally you could not fault Nick Finburgh for effort, he was just great to watch and a fine drive in the lovely C type to 2nd. I expect a big smile was lurking behind the helmet of Till Bechtolsheimer who finished a strong third in the Allard; a finish was what he wanted, so 3rd was a bonus. Tom Walker describes his Allard J2X Le Mans, rather unkindly as 'a bit of a shed' but then he is the owner. Nevertheless the car performed well after an absence of 3 years from the tracks to finish 4th just ahead of the excellent Andrew Sharp in his DB2, the first of our Inter-Marque cars home. In all, there were 26 finishers in this great race and we all look forward to renewed battles in continuation of this Trophy race in honour of George Abecassis. Once the results had been made official, John Turner attempted a coherent address to the assembled drivers and friends, naming the various award winners, with David Abecassis, kindly and most appropriately handing out the awards, anonymously donated, on cue! Thanks are again due to our hosts, VSCC for allowing us to run the race, the Abecassis family for their continued support, our sponsor Woolmer Classic Restorations for their wonderful hospitality unit and most of all, to our competitors who brought so many fantastic cars to this grid. The George Abecassis Trophy is a one of a kind, different to all of our normal races since it provides the opportunity for the sports racing cars to take centre stage whilst giving our FISCAR production sports and GT cars a chance to test their mettle against their racing brethren. It is very much hoped that, with continued Abecassis family approval, and VSCC agreement, it will become an annual fixture at this, their splendid Spring Start meeting. EXTRAS - We have so many photographs of this race that we have prepared additional pictorial features to display those cars not included in the main report. In addition, there is a short piece on those FISCAR members who participated in the VSCCs 1950s Sports Car race at the same meeting. All follow the results set out below. COLOUR COORDINATION - GAT MAKES FASHION STATEMENT! 7 Austin Healeys raced in GAT representing almost 25% of the grid! The following day, the VSCC ran their own race for 1950s sports cars. Since it allowed later cars to run than GAT, the frontrunners ran at a quicker pace and for the early laps provided an enthrallingly close fought battle between several big engined cars and Peter Horsman's little Lotus 15. Whilst outpaced on the straights Peter was able to hang on through better handling and demon late braking and when the bigger cars started to run out of brakes, took the Lotus into the lead to win by just under 4 seconds from Barry Wood's Lister Jaguar and Darren McWhirter's Tojeiro Jaguar, with Tony Bianchi's fantastic Farrellac, that ran with us a while back when driven by Pia Bianchi, 4th. Several FISCAR members ran in this race with varying degrees of success, and there follows a few photographs with captions to indicate how they fared. Peter Campbell entered the Wingfield Bristol Special, a Chairman's car, and shared it with Andrew Mitchell. Unfortunately, it trickled to a halt in Luffield after 17 laps. 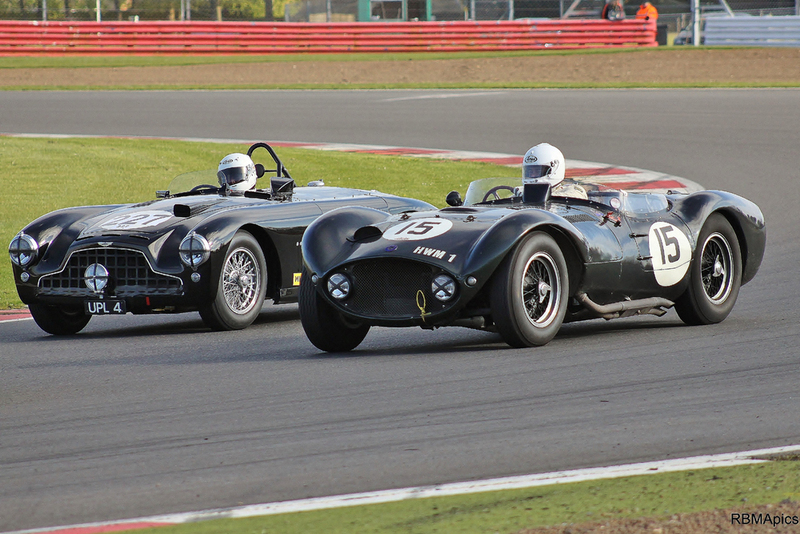 Andrew Moore's MGA was clearly outclassed in this field but he enjoyed himself and finished 17th.